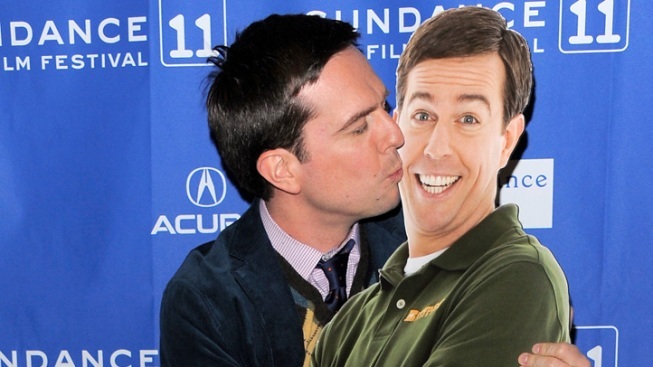 Last night's "Saturday Night Live" was noteworthy for an abundance of surprise guest stars as "Hangover 2" comedian Ed Helms took his first turn as host. In his monologue, Helms reminisced about how a baton-twirling routine at the age of six was the "Eureka!" moment that got him into comedy (it also got him beat up by his brother). He donned a skintight, spangled suit to bring his career full circle and twirled some batons. The batons weren't flaming, but a digital short later in the show would remedy that as Ace and Gary, the lovable Ambiguously Gay duo, made a triumphant return to the screen. The usual assortment of sexual innuendos followed between the cartoon characters voiced by Stephen Colbert and Steve Carell. In a twist, however, Ace and Gary were zapped by a ray gun that turned their animated selves into... Jon Hamm and Jimmy Fallon? Stephen Colbert and Steve Carell were there, though, playing a pair of mad scientists who found themselves transfixed by Ace and Gary's antics. The recurring sketch "What's Up With That?" featured musical guest Paul Simon, Glee's Chris Colfer, and Bill Hader as the long-suffering Lindsay Buckingham who never gets the chance to talk. But this time, he was joined at long last onstage by the real Lindsay Buckningham, who said his piece by shredding a sweet guitar solo. Next week, Justin Timberlake closes out the season with Lady Gaga as musical guest. Dare we hope for a new smash hit Digital Short?